During this summer Kern River Outfitters guides Deb Meymarian, Ryan Guy and Will Volpert will head north to work for our affiliate, Rogue River Journeys, on Oregon’s famous Rogue River. The Rogue is an amazing river with fun rapids, beautiful scenery, bountiful wildlife and pleasant summer weather. Deb Meymarian has guided since 1994, splitting her time between the Lower Kern and the Rogue. This summer she will be our lead guide on a Rogue River wine tasting trip that will pair vintages from the southern Oregon region with wines from the Mediterranean regions of France and Spain. Ryan Guy has guided on the Kern for seven seasons. 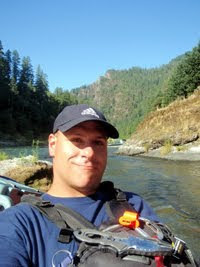 In 2009, after enrolling in a Master’s in Communication Studies program at Chico State University, Ryan worked on the Rogue River Journeys crew. This summer he’ll be paddling big water on the Kern into July, and then will head to Oregon to work three Rogue trips before school starts in August. Kern River Outfitters operations manager Will Volpert has grown up on rivers, first rafting the Rogue with his parents at the age of six months. This August, he’ll be back on the Rogue to lead our kayaking instruction trips with DeRiemer Adventure Kayaking. Click here for more information about Rogue River rafting vacations, or give Jim Ritter a call at 1-866-213-7754.